Yesterday in our first impressions from the Gridseed 5-chip Scrypt ASIC device we have shared that the modified version of the cpuminer software is not reporting local hashrate. This is a problem as you can hardly know what is your current hashrate, especially when you start overclocking the device to get some extra performance out of it. You need to rely on information reported by the pool about your worker’s current hashrate, but these tend to often report lower or inaccurate results than actual hasrate. This is due to the fact that pools base the reported hashrate on the submitted shares for a given period of time, so result can vary. We can report that the average hasrate we are getting from our 5-chip Gridseed DualMiner ASIC device in terms of Scrypt mining performance to be hovering around 300 KHS with the stock frequency of 600 MHz that the five Gridschip GC3355 chips inside run at. 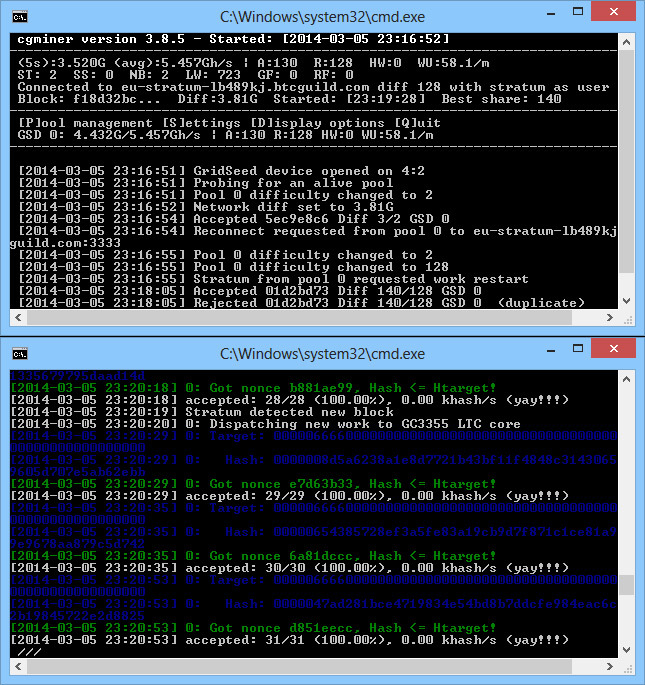 We could get the chips to run at about 850 MHz, but they were giving out quite a few HW errors, at least visually as the cpuminer software does not report actual number of stale shares or HW errors that the device makes. Seeing a lot of the red error messages means you are probably getting a lot of HW errors and should try reducing the clock frequency with 50 MHz or more. 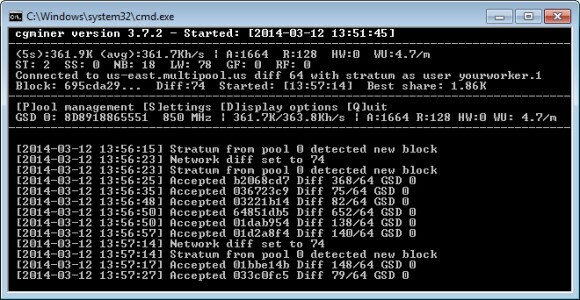 With 800 MHz the device was running more stable with much less HW errors, however this result was achieved with the use of the standard cpuminer software supplied with the device. Apparently this version of cpuminer had a bug and did not disable the BTC core and as a result mining Scrypt only you can get up to about 60W power consumption. By using the newer fixed cpuminer for Gridseed the power usage got down to the 8-9W range and we could overclock the device at 850 MHz with more stable results and very few HW errors. 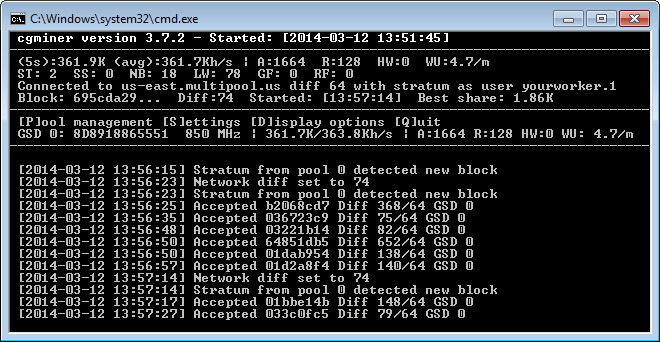 With 850MHz clock we got pools to report hashrate going up to about 400 KHS which is definitely a nice improvement though the newer version of the cpuminer still does not report local hashrate, so it is hard to get more realistic rate for the performance of the device when overclocked. If you wan to overclock the Gridseed ASIC devices you need to use one fo the preset frequency values as they will not accept just about any frequency that you send to them. The lst of accepted frequencies consists of the following values: 250, 400, 450, 500, 550, 600 (default), 650, 700, 750, 800, 850 and 900 MHz. It is possible that with the version of cpuminer linked above that ensures low power consumption the ASIC devices may be ale to run pretty stable even at 900 MHz, however we still haven’t extensively tested that. Still even when using 850 MHz with about 400 KHS does not sound bad at all as compared to the claimed stock 300 KHS at 600 MHz.